A feature-length movie based on Lego brick toys can’t possibly be anything more than a lazy, crass marketing ploy. Admit it, that was your instinct going into The Lego Movie in 2014. But the one-joke premise was on us, as the Oscar-nominated entry turned out to be delightfully fresh and funny. With that gold-brick standard, The Lego Movie 2: The Second Part was bound to disappoint. But while not everything is indeed not awesome in this sequel, it’s still pretty good. Once again, the zippy script is packed with so many irreverent, for-the-parents-only pop-culture references that I couldn’t write them all down fast enough. (I could have sworn I heard a quip about Radiohead!) The original musical numbers — especially the ditty that plays over the closing credits — are witty, sugar-coated pop confections. Kids and adults will sit through this, no problem. And, may I add, there are sparkles galore. 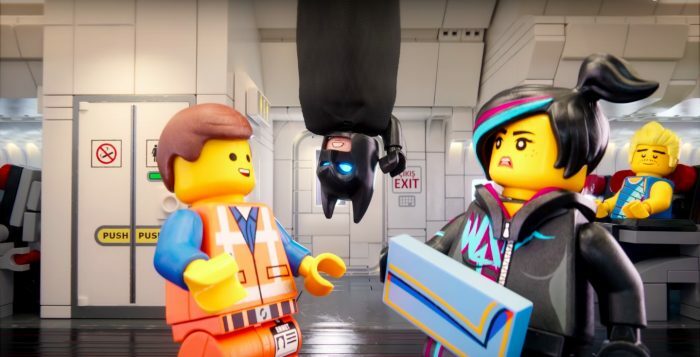 But beyond the usual predictable sequel-itis issues, The Lego Movie 2 is missing a certain spark. A story cribbed from various Toy Story installments makes this plastic less-than-fantastic. Five years have passed since the Little Sister was introduced to the wonderful world of Legos. Whereas the boy from the original crafted adventure stories with a hero and villain (as depicted in the First Part), we learn that Little Sister likes her Legos cute and oversized and harmonious. She’s also a one-person wrecking ball to Big Brother’s meticulous creations. That’s not necessarily great news for our favorite cast of miniature characters. 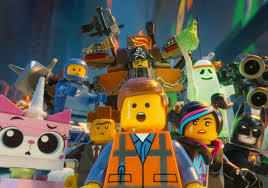 Emmet (Chris Pratt), Lucy (Elizabeth Banks), Batman (Will Arnett), Unikitty (Alison Brie) and Metalbeard (Nick Offerman) and Green Lantern (Jonah Hill) are now living in a post-apocalyptic version of Bricksburg. Everyman Emmet is still his super-duper cheery self, but warrior Lucy is a proud brooder with a hardened heart. She wishes that Emmet would man up just a bit. Their squabble is broken up when aliens from a distant planet invade and take a handful of prisoners, Batman and Lucy included. Oh, no! They can’t possibly free themselves from those binding, colorful stickers! Emmet sets off to rescue his pals, helped by a new character called Rex Dangervest (also voiced by Pratt). The stubbled, chiseled Rex is part Han Solo, part Indiana Jones, part Jurassic World raptor trainer. So, basically, all the roles that Pratt has either played or been linked to over the past five years. Clever girl. Ultimately, either Mom is going to make her kids throw these bright, painful-to-step-on bricks into a depressing storage bin as a punishment or the fun will live on. Let’s get on with it. There’s too much at stake for option No. 1 to even be considered. Besides, this is The Lego Movie 2, not Glass. Creativity can’t be stifled and locked away! If you build it, audiences will come.